Do You Know this Lakewood Business? Tom Peterson with a tray of House of Donuts' finest. Here are four fun facts. See if you can guess this local Lakewood business. This business is the second point of interest on the Lakewood Historical Driving Tour map (maps available FREE to visitors at the Lakewood Historical Society and Museum. Free Admission Wed – Sat, Noon -4). Clover Park High School Class of ‘77, multiple gold medal winner, and inductee into the Roller Skating Hall of Fame in Lincoln, Nebraska, this Lakewood business owner began competing at the age of three at a local entertainment spot at 7455 South Tacoma Way. What is that spot? A wonderful example of famous Googie architecture resides right here in Lakewood and soon will have its own Historical Society marker. Open from 6 am to 6 pm every day of the week, generations have been coming here. 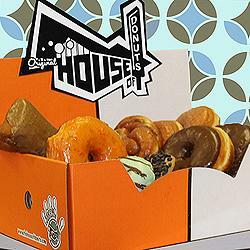 If you guessed Original House of Donuts, you are correct. People not up on such things might not be familiar with the name of the architectural style popularized in the 1950’s and ‘60’s known as Googie, but they recognize it when they see it. Space age design motifs were everywhere from living rooms to landscapes during the last mid-century. Think Seattle Space Needle, LAX airport, or a vintage McDonald’s. We have a fantastic example of Googie architecture right here in Lakewood, nestled unassumingly on Gravelly Lake Drive between Bridgeport and 100th streets. Opened by Bob and Marilyn Cheatham in 1959, House of Donuts has long been a favorite stop and staple among locals clamoring to satisfy their donut craving. For generations, people have been coming, with literally millions sold. 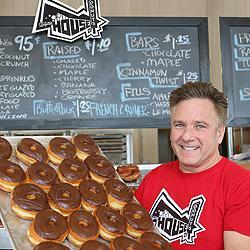 Thanks to new owner and Lakewood native, Tom Peterson, House of Donuts is destined to become an “experience” restaurant that could gain national attention. Out-of-towners are catching on to the quality, freshness, and value found here at our local, historical spot. They are coming from as far away as Seattle to have one, ahem, or take home a few boxes. Like any smart business person, Tom has the uncanny ability to know what his customers want and he seeks to give it to them, including great counter and window servers who are friendly, smiling people. You could say, “Everything old is new again.” House of Donuts is experiencing a resurgence, with plans in the works to restore, but not change, the original look—to preserve and respect the integrity of the iconic building while still allowing for modern amenities and upgrades. 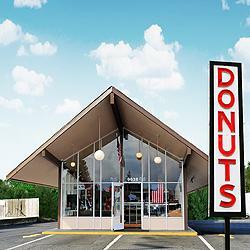 The changes are coming, but the particulars, like the proprietary donut recipe, are a secret. With the planned improvements, and a second House of Donuts location which will pay homage to the period look of the original, opening soon in downtown Tacoma, new generations will get the chance to experience what we already know: the donuts are really, really, good. You have to rise very early in the morning to make them fresh and warm, with long hours on your feet, but Tom is used to hard work. He and sister Lin were both competitive athletes in the sport of speed roller skating during their youth in Lakewood, their mom coaching them inside grandparents Roger and Delores Adams’ business, the Tacoma Roller Bowl, on South Tacoma Way. Tom, ever the trailblazer, won many world titles and gold medals at International Speed Skating competitions in Italy, Puerto Rico and New Zealand among others, and in the 1980’s, he was considered the top speed roller skater in the world. In 1984, he hung up his skates for good but says he is grateful for the opportunity to “experience other countries and cultures.” After skating, he lived and worked in Southern California and in 2012 he happened to hear that House of Donuts was looking for a new owner. It was the opportunity he wanted to return “home.” Causes he cares about range from supporting the Wounded Warrior Project and Breast Cancer Awareness. At the end of the day, leftover donuts, if there are any, are given to FISH food bank. Tom joined the Historical Society because he says, “Lakewood has been good to my family as far back as my grandparents.” “I want to give back to Lakewood.” Preserving his iconic building for future generations is just a beginning. He is passionate about living a life that through his daily actions has an impact on the lives of others. We support what you are doing, Tom, and all of us thank you.